A roof peppered with clumps of moss is a big repair bill just waiting to happen. Dappled shade from trees or the naturally shady north side of a home is prone to moss in many regions where cooler temperatures prevail. These conditions can create damp areas out of the harsh sun where moss moves in and spreads along the cracks and crevices of a roof. 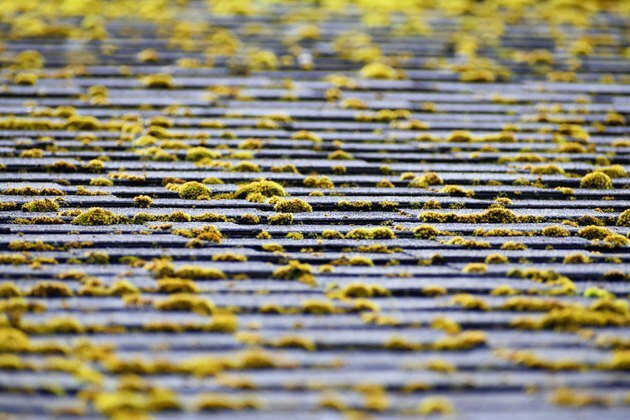 Moss can be physically removed from the roof by hand. It's a tedious job, but it is easier on the tiles than more invasive techniques. For large expanses of an asphalt-shingled roof, use a long-handled scrub brush made for cleaning gutters and roofs. A pressure washer can eradicate the moss from the deep crevices and prevent it from returning next season. Any time a heavy-use tool is used, particularly the strong jet of water from a machine, tiles or shingles may be shaken loose, cracked or otherwise damaged. Be careful with the pressure and application of scrub brushes and the stream of water from a pressure washer. Always work down the roof line from the top of the ridge to the eaves. Check under the eaves for errant colonies of moss that have taken root far from the damaging rays of the sun. Cleaning asphalt shingles is a physical job, requiring a lot of work at a great height. Be prepared and take safety measures to makes sure that the job doesn't get the best of you and cause injuries that can last well through the moss-growing season. Roof moss removal is naturally slippery work. Check the ladder feet for defects, cracks or corrosion. Replace or install slip-resistant pads on the feet and steps of the ladder before getting to work. Have gloves with good grip material on the palms and fingertips to help you keep steady while removing clumps of moss from the asphalt shingles. If you are using commercial chemical cleaners or homemade cleaners with bleach or ammonia, wear protective eye wear, protective clothing and rubber gloves. If you are around electrical wires when working on the roof, a fiberglass ladder is safer. No matter how well-built a roof is, moss is naturally attracted to the fissures between the tiles and shingles that cap a home and give it shelter from the elements. It thrives in the shady north side of a home or where trees provide cooler temperatures away from direct sunlight. To keep moss at bay, install copper or zinc roof strips along the ridge of the roof. These moss-prevention strips are easily installed under the lip of existing asphalt roof tiles. Cut back any tree limbs that create a nest of shade where moss tends to flourish. There are many environmentally friendly chemical moss removal cleaners on the market from which to choose. They are relatively inexpensive and do a thorough job after just one application. A homemade cleaner of one part liquid chlorine bleach to one part of water can also be effective in removing and killing moss that clings to the roof tiles. Apply liquid cleaners with a hand-pump sprayer or with a pressure washer on the lowest setting so as not to cause any damage to the shingles. Always rinse off the tiles after cleaning with a chemical or homemade cleaner to remove any lingering solution that can cause the shingles to deteriorate.